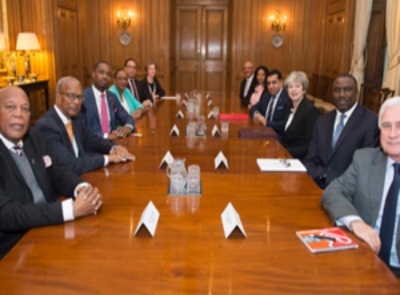 LONDON, Nov 28, CMC – Prime Minister Theresa May Tuesday held talks with the leaders of the British Overseas Territories (BOTs) according to an official statement issued here. A Downing Street spokesperson said that May met with the leaders from 10 BOTs for the start of their annual Joint Ministerial Council meeting. “She opened by setting out the Government’s desire to cement the enduring partnership that exists between the UK and the Overseas Territories, and the UK’s ambition to support their diverse economies and natural heritage,” the spokesperson said. During the meeting May reiterated the United Kingdom’s commitment to long-term reconstruction efforts following the devastating consequences of Hurricanes Irma and Maria, and invited the leaders of the islands worst affected – including Anguilla, the British Virgin Islands and Turks and Caicos – to speak of their experiences. As part of the UK’s continued efforts, the Prime Minister confirmed a new £70 million (One British Pound =US$..33 cents) package of recovery and reconstruction support, supplemented by up to £300 million of UK loan guarantees for territories that need support to access finance. The statement said that the leaders welcomed the financial commitment, and reiterated their appreciation for the UK’s rapid response that offered support within hours of the disaster. “The Prime Minister took the opportunity to update the leaders on the progress of our discussions with the European Union, and invited leaders to express their views so they could be properly reflected in our strategy for Brexit negotiations,’ the spokesperson said. She also raised the issue of financial services, noting the increased focus on taxation and transparency that have come to the fore since the recently leaked Paradise Papers. May recognised that a lot of work had been done following the Panama Papers last year. 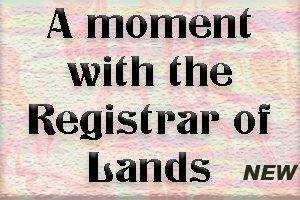 “She thanked the Territories for the leadership they have already shown, including steps they have already taken to implement international standards, and asked for similar leadership to show what more can be done to make further progress on the issue,” the spokesperson added.